Sometimes you need a quick and easy craft on a lazy day; one that doesn't require messy paint or excessive drying time. That's exactly what these refrigerator build-a-robot magnets are. I got the instructions to make these magnets from my super-talented friend and best-aunt-ever Kate over at Katy Kakes. Pick up the supplies next time you're at the craft store and save this activity for a rainy/snowy day! 1) Cut the adhesive back foamed sheets into shapes to be used as part of the robots' bodies. Big squares and rectangles can be used as robot torsos; long rectangles can be arms and legs; semi-circles and squares can be heads, etc. 2) Remove the adhesive backing from the foam shapes and attach to your cardboard or cardstock. Use your scissors (an exacto-knife would work too) to trim the sturdy backing to the foam shapes. 3) Remove the adhesive backing from your magnets and attach to the back (cardboard/cardstock) of your robot parts. You will want to trim your magnets down into small squares if you bought them in large sheets. 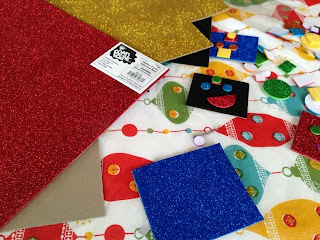 4) Decorate your robot parts with additional foam shapes to make faces, buttons, etc. If you don't have pre-cut foam shapes, you can cut out your own from your foam sheets. You may also want to dab some glue onto the backs of your accesso1ry shapes as the adhesive foam seems to lose its stickiness after a while when attached to other foam pieces. 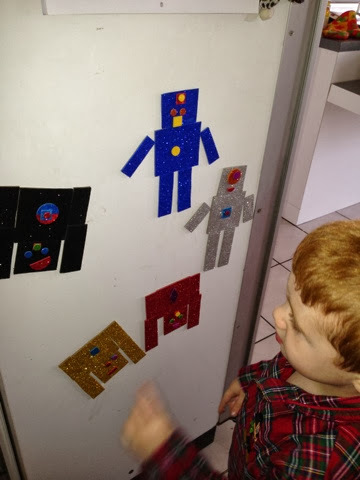 5) Play with your build-a-robot magnets on a refrigerator or metal cookie sheet! You can also cut out any other shapes that you want. Dolls with interchangeable dresses, cars, geometric shapes, etc. There really isn't a limit to how creative you can get with this craft, and best of all its simple while still being a lot of fun.